Inspired by the food of Valencia this dish has a bit of wholesome soul-food about it, while maintaining a vibrant taste of Spain with the Pimenton and garlic. The pork becomes tender and just melts with flavour. We served it with tasty new potatoes and some tender-heart cabbage quickly fried with a little butter. Heat 2 tablespoons of the olive oil in a large shallow flame-proof casserole dish. Add the 4 whole garlic cloves and the slice of bread and fry over a medium heat for 2 minutes, turning one, until golden. Lift out and leave to drain and cool. Cut pork into 2.5cm/1 inch slices and then into 75-100g pieces. You want them to be quite large. Season well then dust them in the flour. Add another 2 tablespoons of olive oil to the pan and add the pieces of pork to seal and only lightly colour. Remove to a plate and set aside. Add the remaining oil to the pan with the onion, chopped garlic, pimenton dulce, thyme and bay leaves and cook gently for 10 minutes until onions are soft and sweet but not browned. Add the wine and stock and bring to the boil, rubbing the base of the pan to release any bits and pieces. Return the pork to the pan, lower the heat and season well. Cover and simmer gently for 1.5 hours or until the meat is meltingly tender. Spoon about 16 tablespoons of the sauce into a liquidiser or food processor and add the fried bread, fried garlic cloves, almonds and parsley leaves. Blend to a smooth paste (this is called a picada in Spain). Stir the picada back into the pan, taste and adjust for seasoning, cover then cook for a further 5 minutes which will allow the sauce to thicken. I love your blog and especially the Spanish-influenced dishes, having just ‘borrowed’ Rick Stein’s Spanish cookbook from my mum I am planning on working though it. 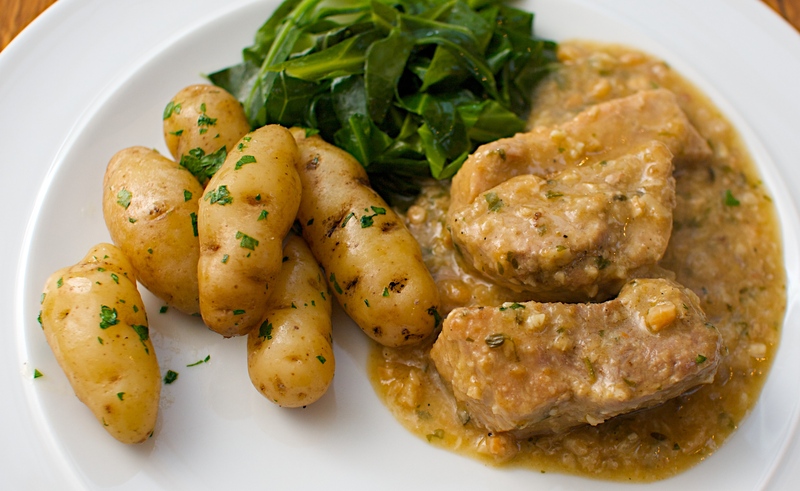 This pork dish reminds me of one in that book which I have my eye on, I will certainly be trying it.